It's easy to forget that Family Affair was one of the most successful series on American television in the 1960s. During its five-year run that started in 1966, it finished in the Top 5 in the Nielsen ratings for three consecutive seasons. It was nominated for an Emmy twice as Outstanding Comedy Series, with stars Brian Keith and Sebastian Cabot also receiving Emmy nominations. Although best described as a family-oriented sitcom, Family Affair occasionally tackled serious themes--and that brings us to the fondly-remembered season 3 episode "Christmas Came a Little Early." Eve Plumb as Buffy's friend Eve. The episode guest stars Eve Plumb as a sickly young girl who participates in Buffy and Jody's school class via a telephone speaker (Buffy describes Eve as "just a funny electric box to us..and a voice"). Buffy's teacher asks her to deliver a book to Eve, who lives just around the corner from Uncle Bill's apartment. The two young girls hit off immediately and quickly become good friends. When Buffy learns that Eve can barely leave her bed, she confides to her new friend that Uncle Bill can fix anything. Bill calls a physician friend and sets up (and pays for) a battery of tests to determine the extent of Eve's illness. The result is that he and Eve's parents learn that the girl will likely die within months. With the parents' blessing, Bill comes up with an excuse to celebrate Christmas early with Eve's family. The episode focuses on Buffy and Uncle Bill, with Cissy, Jody, and Mr. French limited to just a handful of short scenes. That works well, since Brian Keith (Bill) and Anissa Jones (Buffy) seem to bring out the best in each other. 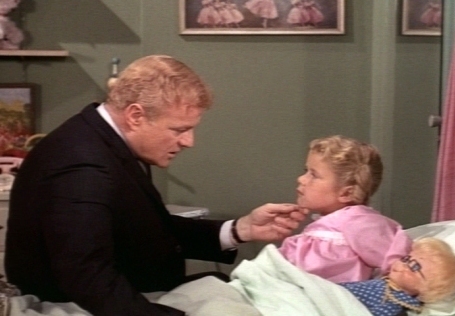 When Buffy asks her uncle to help Eve get well, it's touching to see the look of worry on Brian Keith's face. He skilfully conveys the feeling experienced by many parents who fear that day when their children realize parents are just normal people. It's interesting to note, though, that Uncle Bill tells two significant lies during the episode. First, he tells Eve's parents that a foundation is paying for their daughter's medical tests (the parents figure out it was Bill). Later, he tells Buffy, Jody, and Cissy that he may have to work in Venezuela over Christmas--hence the reason to celebrate it early. Yes, his intentions are good in both cases, but, hey, it caused to me to question Uncle Bill as a role model! As the terminally-ill Eve, ten-year-old Eve Plumb gives a natural, restrained performance. She had already made guest star appearances in shows like The Big Valley, It Takes a Thief, and The Virginian. 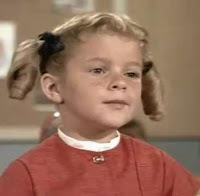 The year after her Family Affair appearance, she would snag the role that made her famous--Jan Brady in The Brady Bunch. To learn more about Family Affair, check out our exclusive July 2015 interview with one of its stars: Kathy Garver (shown on right). MeTV is airing "Christmas Came a Little Early" tonight (Monday, Nov. 16th). This post is part of A Very Merry MeTV Blogathon hosted by the Classic TV Blog Association. Click here to view the entire blogathon schedule. Rick, this is a sweet post about an unconventional "holiday" episode. It was indeed bold to have a show about the impending death of a child. I don't remember this episode but look forward to seeing it air tonight. Thanks for an excellent kickoff to the Very Merry MeTV Blogathon! This sounds like a powerful episode, especially for youngsters when the show was first aired. I need to check it out! The way this episode raises hope for a moment and then crushes it again, and that final scene...it's a wonderful episode but difficult to watch. If memory serves, the only episode of Family Affair I'd watched in full prior to this was the pilot. This episode was certainly a tear-jerker. I think Uncle Bill might have actually been responsible for three lies in this episode, if you count the part where he has Mr. French pretend to be Santa Claus for Eve. Technically, anyone who tells kids that there's a real Santa who really lives at the NorthPole with elves and flying reindeer is lying. But that's splitting hairs. Yes, it's three lies for Uncle Bill with Mr. French an accomplice on one. It's easy to forget that Family Affair was one of the most successful series on American television in the 1960s. Not that I haven't tried, with copious amounts of liquor. I remember this episode...heck, I remember all of the Family Affair episodes -- because it was my sister Kat's favorite show when she was a kid, and in those days you had to be democratic and watch what your siblings wanted (it's nice to share) even if Affair was a danger to your blood sugar. 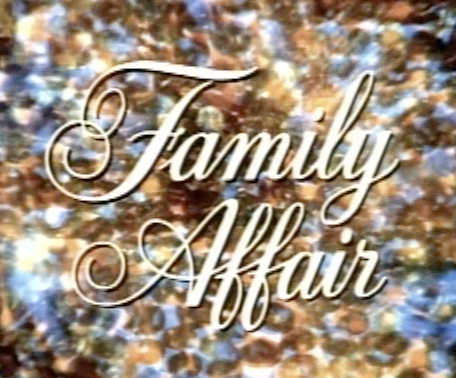 To prove there was a time when I had too much disposable income, I purchased all of the Family Affair DVD sets when they came out and started watching them, thinking maybe they might look better in hindsight. I don't think I made it past Season 1. Well-written entry, my good man -- even if the series wasn't one of my favorites. Lovely write-up. I have never actually watched an episode of Family Affair. (Although, oddly enough, I have lied about watching episodes of Family Affair.) I think I might finally try the show now (if only to stop all those lies). You brought back such lovely memories. I don't remember this specific episode, which I'm sure I saw on reruns of the series, but I loved these characters and show. A great choice and lovely tribute. What strike me as kind of extraordinary about the episode is that, only at the end do you realize that Buffy knew the whole time that her friend wouldn't survive through Christmas, but she stays cheerful, until she finally breaks down in tears in the end. No explanation is given for her tears, which makes the scene much more poignant. That's a great point, Kevin. I was a little jarred when that episode went on Buffy crying to the cheerful FAMILY AFFAIR theme over the end credits. These days, they might have played different music at the end. Very nice post! I barely remember Family Affair though, like Ivan, I think I watched it with my sister after school as a kid in '70s reruns. Brian Keith is an underrated actor. One of the things that makes this episode even more emotional for me to watch is that the little dying girl is played by Eve Plumb. (I'm not old enough to have watched this when it originally aired). Even if Jan Brady isn't my favorite Brady, the actor is a very familiar one. I think I mourn this loss a little deeper than if a less recognizable actor played the part. Thanks for your essay Rick. When I was a kid, we got 2 maybe 3 TV stations since we lived in the middle of nowhere. The closest town were about 6 miles away and neither one had more than 200 people. When we were done with chores, my cousins and I got to watch an hour or two of TV. 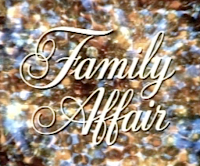 Family Affair was our favorite show. It was already in re-runs, but we didn't know any better. I remember pretty much every episode, especially this one. I liked Buffy and Jody, but I had a huge crush on Eve Plumb after this episode. Still do. I love that there are classic TV networks that run these old shows. They're cheesy as all hell by today's standards, but I think that's why people love them. They take me back to a time when life was fun and easy, they're a lot better escape than drugs or alcohol. They're a happy place. DVD Spotlight on "The Bold Ones: The Lawyers"